We have been watching the devastation that is happening around the state related to the blizzard and flooding, and have been trying to monitor the impact on our dairy farmers. We know the stress level has been enormous, and want you to know that you are in our thoughts. We have remained in contact with the Governor’s office, Department of Agriculture and with Emergency Management. In communications with the Governor and State Patrol, we were able to get the weight limits lifted for hauling milk to the processor, and the Governor is working with our neighboring states to expedite the situation across state lines. S.D. has been charging $25 per load, but we are trying to get that waived. They are also working to exempt the “hours in service” for our haulers, knowing they are having to travel extra miles and extra hours to make their pickups and deliveries. We have also worked with the Director of Ag, as the put together a request to the Fed’s for an expedited application for emergency assistance. We would like all of our dairy farmers to report to us any issues you have had, or are continuing to have. Livestock losses, milk dumped, facilities damages, etc. This information will help us in communications with all the authorities, who are working day and night to get relief and support for all of agriculture. Again, please notify Kris Bousquet krisbousquet@NebraskaMilk.org or Rod Johnson rod@nebraskamilk.org with any information you have for us. Our thoughts are with you, be safe! There have been several concerns about calf losses due to weather and flooding. There are several programs through the FSA that can assist. With stressful situations like this, check-up on neighbors and friends. Help is available and there is always someone who is willing to listen. a) If you have suffered a loss of livestock, you need to report those losses to your FSA county office within 30 days of when those losses become apparent. This 30-day notification window is critical. **A phone call to the county office works for this notification. - Keep in mind, outside of the immediate situations, some producers had some extreme weather in February where folks suffered livestock losses, so depending on when those losses occurred in February, that notification window is closing. b) Documentation of losses also is critical. FSA will need some sort of supporting evidence of your losses, and this can include things such as: veterinarian certification, other independent third party certification, rendering receipts, dated photos or video. Those things are an important part of the application process. c) FSA will also need to know the type or weight of the animals lost. Adult animals, so bulls and cows, vs. calves or yearlings, are broken out differently in the LIP program, so that part of the record is important. 2) Emergency Assistance for Livestock, Honeybees and Farm-Raised Fish (ELAP): This program covers some livestock losses that do not fall under the Livestock Indemnity Program. Specific to the current adverse weather situations in Nebraska, ELAP may be applicable as it can, in certain situations, financially assist with livestock feed losses, such as bales that may have been destroyed in the flood. **Attached is the most recent Fact Sheet about ELAP. 3) Emergency Conservation Program (ECP): ECP can provide some cost-share assistance to rehabilitate farmland damaged by natural disasters. It also can provide cost-share assistance to help restore fences damaged or lost due to natural disaster. There is quite a bit to this program, and it doesn’t trigger automatically. FSA county committees will need to make a request for this program in their local areas. It is critical that producers, if they think they may want to access this cost-share resource, contact their county office about this program before taking any action to repair damages. **Attached is the most recent Fact Sheet about ECP. 4) HAY NEEDS: Those in need of hay: Please contact Nathan Mueller (nathan.mueller@unl.edu or 402-727-2775) as soon as possible if you are in need of emergency hay supplies due to flooding. For all affected by the weather catastrophe facing Nebraska, please know that our thoughts are with you. We would like to share with you some resources that might help you or someone you know through this difficult time. 5) Nebraska Extension Flood Resources (flood.unl.edu): This web page provides information on assessing crop damage after a flood, well water safety, managing a septic system during a flood, preparing a home that will flood, clean up after a home is flooded and more. 6) Nebraska Counseling, Outreach and Mental Health Therapy (COMHT) Program, 800-464-0258 - Offers no-cost vouchers for confidental mental health services for persons affected by the rural crisis. 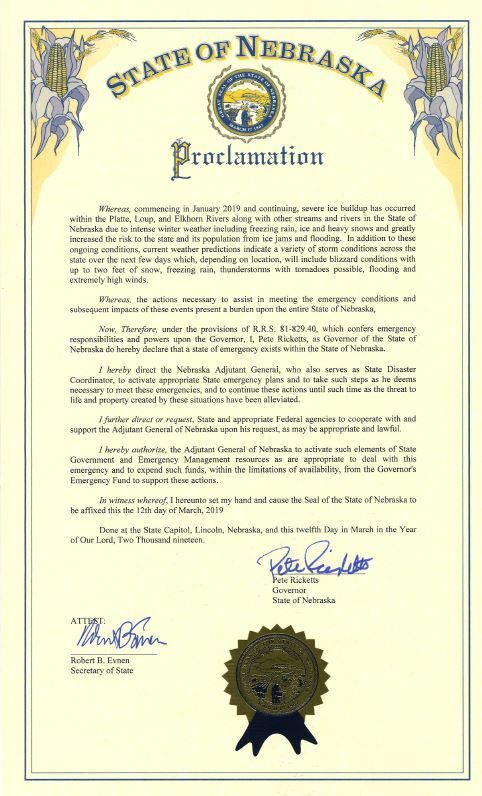 Thank you for the opportunity to work together as we address the many concerns presented by the recent storms and the affects being felt by Milk Producers here in Nebraska. In concern with the Governor's Office and the stated Emergency Declaration, we would like to build a framework that will help define our Agency's response to enforcement activities related to a weight easement during this emergency period and share a consistent message between enforcement and producers. It would be my desire to visit with you to discuss what the best plan should look like. totality of circumstances will be reviewed by NSP and members of the Dairy Farm Producers and determine if a longer extension is needed. As discussed, we have no authority in other states, however our neighboring states have been notified of our request. In a worst case scenario, South Dakota has informed us they will sell them a $25 permit if needed. I have not received word from Iowa at this time. These times are certainly difficult for many Nebraskans, and I understand that our Dairy Producers are feeling a particular strain. I look forward to continuing our visit at your earliest opportunity. Thank you.